It was time for our third meeting of the day. We were both exhausted, half brain-dead, and ready to relapse into our introverted selves. Nevertheless, we persisted, and we are so glad that we did! Walking in to Andy’s Igloo, a classic All-American dive icon in Winter Haven, we could spot our new friend, Carolyn, instantly- in a crowd of people, our trained eyes can spot yarnies- wearing a lovely hand-knit item amidst a sea of hoodies (it was actually a chilly day, just perfect for bringing out all things wool! ), with an overstuffed bag nearby, brimming with some sort of project peeking out the top. Michelle joined us a short time later, surprisingly un-frazzled considering her commute through Orlando traffic at rush hour. 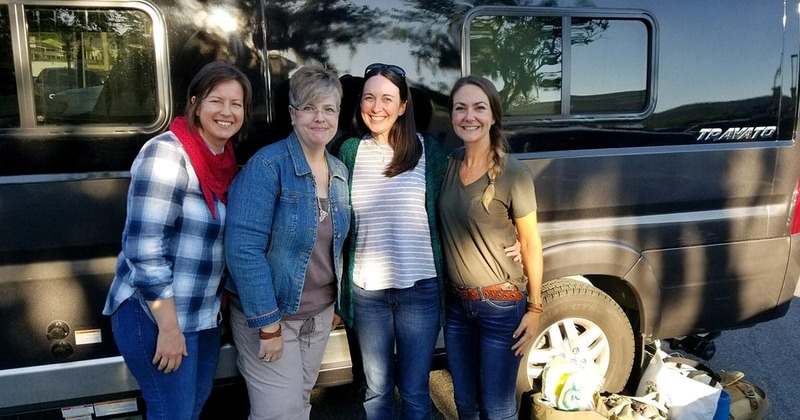 It’s amazing how the words and ideas flowed and our fatigue faded away as the conversation and laughter easily grew from our shared inspirations and love of all things yarn, knitting, and fiber-related. In a world of strangers, fiber makes us all friends. Carolyn and Michelle are the ladies behind Olive & Two Ewe, a brand new addition to Florida’s indie dyer scene. Not only do they dye beautiful colors on over a dozen luxurious bases, they are also hard at work bringing Florida Indie Dyers together, and reaching out to find and grow the local knitting and crocheting culture. When knitters think of knitting destinations, Florida is not likely high on the list, but these ladies want that to change (and so do we!). There is no sizable annual fiber festival in Florida, like Rhinebeck or SAFF, and VKL and Stitches have yet to host events so far south. Olive & Two Ewe, along with three other local indies, are in the process of planning Yarn Lounge events to bring the Florida fiber community together. The first Yarn Lounge will take place June 9th in the town of Winter Park, in conjunction with Worldwide Knit In Public Day. They are hoping to see their idea grow into a larger fiber festival to expand the local yarn enthusiasm. In a world of increasing competition from online retailers, Carolyn and Michelle are looking to foster new knitters and crocheters, and contribute to a fiber community where we all hold each other up. If we spread our love of fiber to fellow artists and create new knitters (and crocheters! ), all the makers and sellers will benefit. While Olive & Two Ewe can be found in a few shops in the midwest, their main goal is to promote direct sales through fiber shows and pop-ups. They love meeting the wonderful people that make up the yarn community and can be found crashing knit nights all over central Florida. Purls and Prosecco? Yes, please! You can find out where they’ll be next by following them on Instagram. Carolyn and Michelle also have a podcast, called The Traveling Two Ewe, that they record in different beautiful locations around central Florida. While Carolyn is the main dyer in the twosome, Michelle handles the social media and online presence. They complement each other well, sharing ideas and responsibilities, each putting forth her best self and promoting one another’s strengths. Both are brimming with creativity and love for what they are doing. Finally, what is Olive & Two Ewe? Say it fast, all mushed up in your mouth. Now say “All love unto you.” Doesn’t that just make your heart smile? Michelle and Carolyn are great and I am looking forward to the Yarn Lounge! Olive & Two Ewe are amazing! Michelle and Carolyn are truly the best at creating Fiber Awareness and their enthusiasm for gathering fellow fiber lovers is not to be outdone. Their Yarn Lounge, Yarny Ewes, and Olive & Two Ewe Studios bring Facebook, Instagram, Podcasts and You Tube to life! They can be found many Saturday mornings Live on Facebook from locations (including The Little Craft in Celebration, Florida) that jump start their day (with tea or coffee) of knitting classes, yarn dyeing classes or meditative knitting. 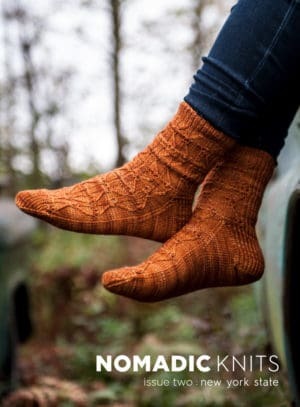 Choosing fibers and colourways is always exciting and joining in cast-ons, Socktober, CAL’s and KAL’s has brought new and experienced fiber enthusiasts together to share knowledge and promote a community of support for all. Meeting Olive & Two Ewe and Nomadic Knits has been a “Yarn Good” Experience!